Tuberculosis (TB) has re-emerged as a serious public health threat worldwide because of an alarming increase in the mortality rates due to drug resistant Mycobacterium tuberculosis strains and a deadly liaison between HIV and M. tuberculosis infection. There is an urgent need for identifying and validating new therapeutic leads to facilitate the development of novel anti-TB drug treatment. An important element in intracellular survival and consequent pathogenesis of M. tuberculosis is its distinctive cell wall, of which peptidoglycan is a major structural, functional and regulatory component. The cytoplasmic steps of the biosynthesis of peptidoglycan are catalysed by a series of ATP-dependent ligases and they play a pivotal role by utilising ATP while incorporating specific amino acids sequentially to the C-terminus of the stem peptide; steps critical for cell wall cross-linking. They share a similar reaction mechanism and are essential for the growth of M. tuberculosis. As the reactions catalysed by these enzymes provide key precursors for the cell wall biogenesis and recycling, they are therefore considered as excellent therapeutic targets at the different physiological stages of the TB pathogen. On a recent trip to India, Dr Sanjib Bhakta, Director of Mycobacteria Research Laboratory (MRL) part of the Institute of Structural and Molecular Biology, Birkbeck, University of London and UCL, visited a number of universities, specialised research institutes, organisations and schools to shed light on the world-class research being carried out at MRL researchers in the field of tuberculosis drug discovery and to discuss new research and educational initiatives with India. Dr Bhakta was invited by the erstwhile Vice-Chancellor of Dibrugarh University, Assam, India Professor Alak K. Buragohain, to engage in an interactive session with the research students of the Department of Molecular Biology and Biotechnology (MBBT), Tezpur University as well as the senior professors of the Department of Pharmaceutical Sciences, Dibrugarh University. 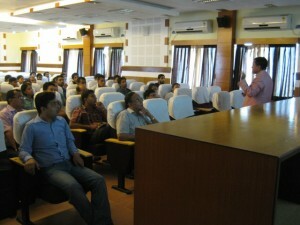 A number of intense interactive sessions, held between July 23 – 25 2013 at the university departments was attended by the department’s students and faculty members and also by those in the Department of Chemical Sciences and Food Engineering and Technology. 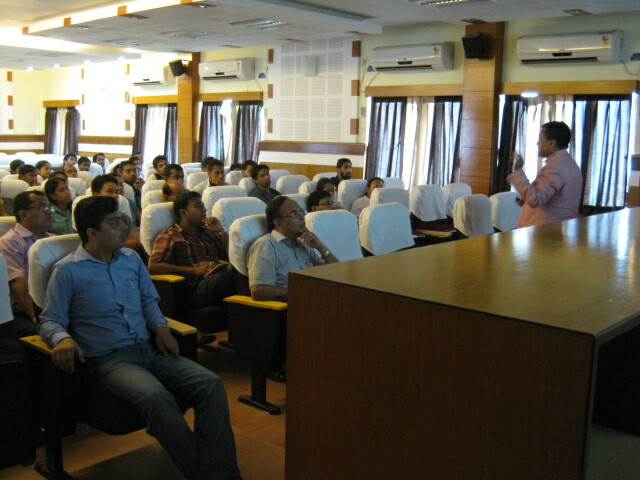 Dr Bhakta spoke about ‘Tackling drug resistance and persistence in Mycobacterium tuberculosis: integrative inter-disciplinary approaches in novel therapeutic intervention’, in the course of which he discussed whole cell assay techniques developed exclusively in his laboratory to evaluate potential anti-infective molecules. Highlighting some of the current work being carried out in his laboratory Dr Bhakta spoke about understanding ligand-protein interaction to unveil the mechanism of action of anti-mycobacterial compounds. He laid special emphasis on the need for an inter-disciplinary approach to fight TB and leprosy. A meeting with Professor Mihir Kanti Chaudhuri, Vice Chancellor, Tezpur University and other senior professors culminated in a proposal to forge collaborations between Birkbeck and Tezpur University, Assam, India. Any collective work between these two universities will benefit from the availability of potential anti-tubercular agents of plant origin harboured in the highly bio-diverse forests of Assam and the technical expertise of Dr Bhakta in testing the effectiveness of these agents in a wet lab setting. Another invited seminar and one-to-one research meeting at which Dr Bhakta spoke was at the National Institute for Research in Tuberculosis, Chennai (India). Collaboration between NIRT and MRL is not new, as a materials transfer agreement already exists between the two world leading institutions. A memorandum of understanding currently being drafted will expectedly consolidate the existing relations. A combination of social responsibilities, university outreach activities and common academic interests led Dr Bhakta to engage with the Indian Development Foundation (IDF). Established in 2005, the IDF is a non-government organisation with a three-fold goal to cater to education, development and health in the rural parts of India. Having been monumental in the elimination of leprosy in India, the organisation has moved its focus to tuberculosis. 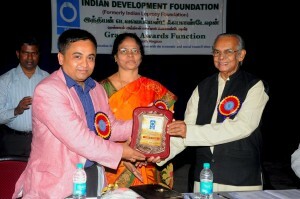 IDF hosted its Annual Grants Release Function on August 7, 2013 at Bharatiya Vidya Bhavan, Mylapore, Chennai at which Dr Bhakta was invited as a Guest of Honour to recognise the efforts of IDF and emphasise the need for continued support to such organisations. The annual feature is conducted to share resources with leprosy/TB projects and recognise schools in the region for their participation in social work and raising awareness of the cause. It was well attended this year with five-hundred audience members and renowned speakers on the panel including Mr. B.S. Raghavan (former Policy Advisor to the UN) and Dr A.R.K. Pillai (Founder President of IDF) and Mr. J. Ravichandran (CEO, German Leprosy and TB Relief Association) to name a few. The event was covered by Indian national television and print media units. In an effort to stir the minds of tomorrow’s researchers, Dr Bhakta also accepted the opportunity to deliver a motivational talk at Maharishi School to a group of 50 A-level equivalent students, addressing their queries and encouraging them to embark on the life of a research scientist. Category: Science Tags: antibiotics, India, Science and biomedicine, TB, Tuberculosis by Bryony.